Am I too early for Easter shenanigans? Eh, I don’t think so. 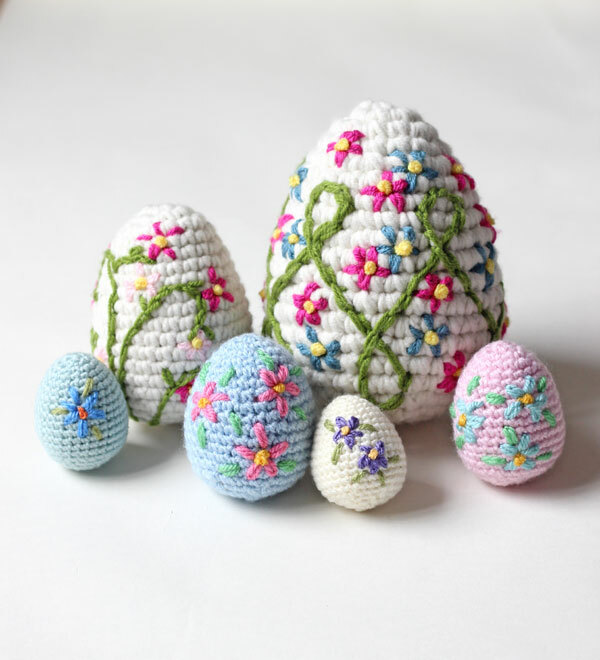 Do you remember the pretty little crochet Easter eggs from a couple of years ago? They’ve gone and got themselves some new mates! A couple of weeks ago I got an email from Hobbycraft asking if I was interested in trying some yarn so that I could tell you about it. Seeing as spring is on the way I thought it would be a nice idea to choose some yarn to make my amigurumi Easter eggs with. However, I didn’t want more eggs of the same size so I’ve upped my game. I’ve gone large. This is the stuff I decided to try, The Women’s Institute acrylic dk. I wanted big eggs this time so I also chose the Soft & Chunky in cream, which is an acrylic mix and has 30% merino. It’s lovely stuff to work with, I think merino is my favourite yarn in the world at the moment. I got the dk colours to decorate the eggs with. With two 100gram balls of the chunky cream, you can make three small eggs and one large. I weighed them before I added the embellishments and a small one was 27 grams whilst the large was 89 grams. It’s exactly the same pattern, I just doubled up on yarn for the biggy. I’ve not used this yarn before but I have used plenty of other dk acrylics. Mostly I’m left unimpressed and I have a thing where I don’t like mixing my brands together because the quality varies so much. Usually they don’t pass muster but I don’t think I’d have any qualms about mixing this with the likes of Stylecraft Special or Paintbox (both of which, are excellent to work with). This is one of the good ones. I have quite a bit of the dk left so I might make blanket along with some other brands to really get a good feel for it (but not anytime soon as I have got a massive list of other projects to do! Bah). Eeehh, look at the family all together! 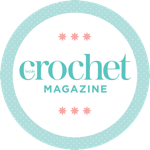 This pattern can be used with any weight of yarn, just make sure you use a hook size that will achieve nice, tight stitches (ie go down a couple of sizes than is recommended). 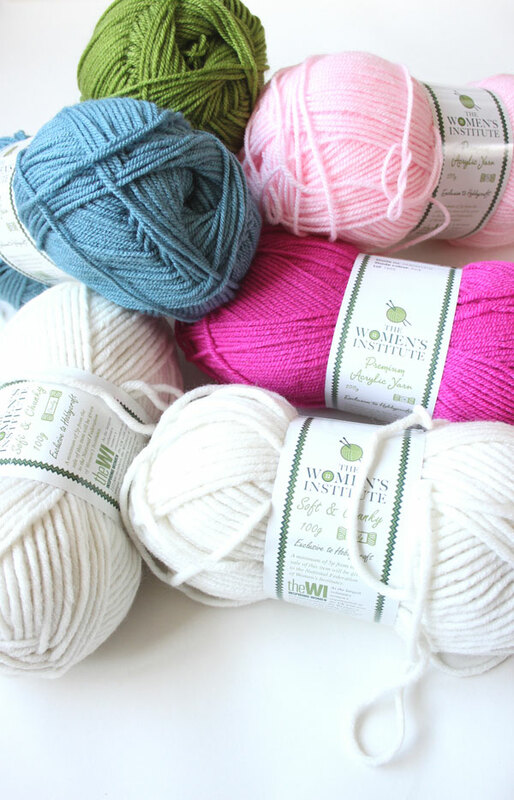 The Women’s Institute Premium Acrylic Yarn DK in Yellow, Lime, Teal, Pink and Light Pink. The Women’s Institute Soft & Chunky in Cream x2 100g gram balls. This amount makes 1 large and three small eggs. Fading ink pen (optional) – it helps to draw out where to put the flowers and leaves before you make the stitches. For the small egg (approx 11cm tall) use the 4.5mm hook. For the large egg (approx 17cm tall) use the 7mm hook and two strands of the chunky held together. 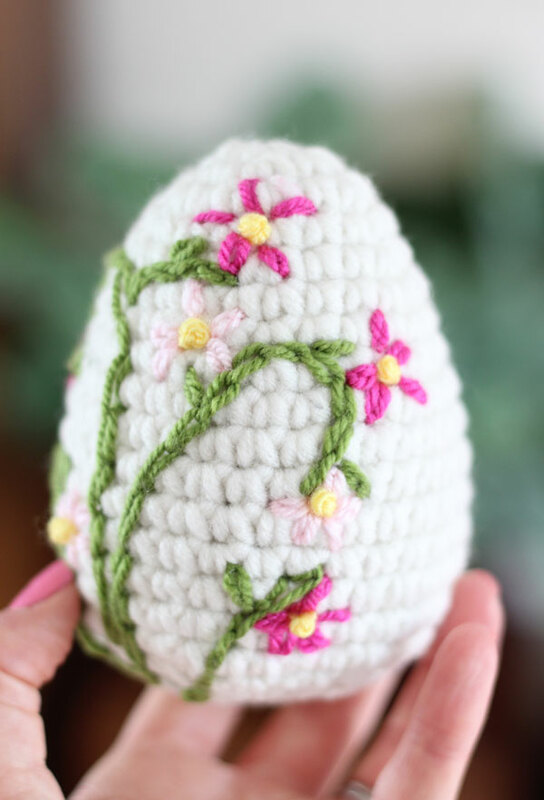 Use two strands of the dk together for embroidering the large egg. This pattern below is also found on my original blog post HERE. 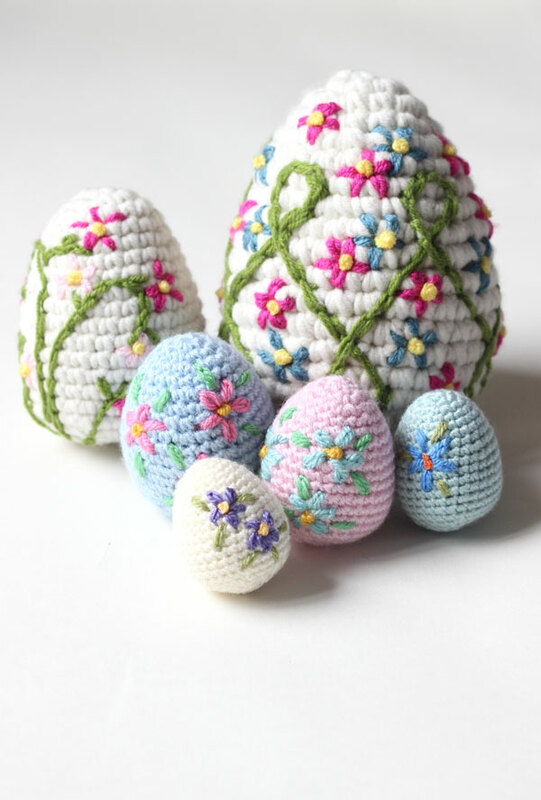 And last year I recorded a video tutorial showing how to make and embroider the eggs, which is HERE over on my YouTube channel! Fasten off leaving a long tail, 40cm should be plenty. Add embroidered flowers using simple stitches. French knots make the flower centres and the chain stitch makes petals, leaves and stems. Stuff firmly. 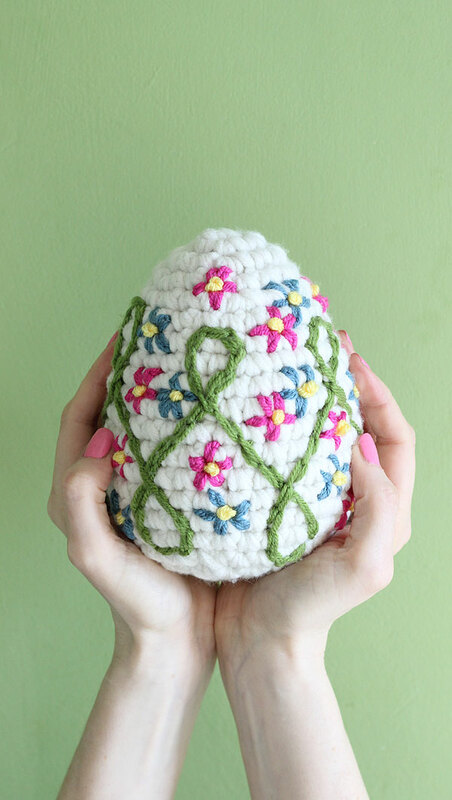 To close the egg, thread through the front loops and pull tight to gather the stitches together. Stitch in and out a few times to fully secure and then snip the end neatly. Please do let me know if you make some, I really would love to see. 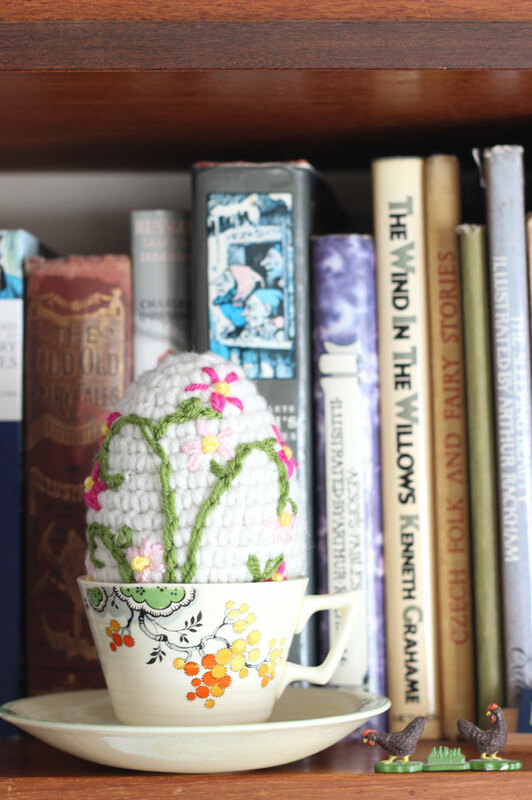 They make such cute spring decorations and you could even tie pretty ribbon through the top to hang them places! These are beautiful! Thanks for the pattern. Oh now! !’n these are just stunning!!! I Just need to find the time now! There’s such a mix out there. There are loads I haven’t tried yet too! I was too busy looking at how gorgeous they are to notice you’d so kindly given the pattern!! Thank you so much! Absolutely beautiful! I’ve made one from the You Tube tutorial and came out pretty nice. Need to perfect the flowers and leaves a bit better. Thank you for the awesome tutorial. Making some now , just finished my first big one . Thank you so much for sharing . I think the big one will make an awesome pinecone ,which I will be making several . Yay! Yes, I suppose it could be a pine cone. I wonder if textured yarn would work with that? 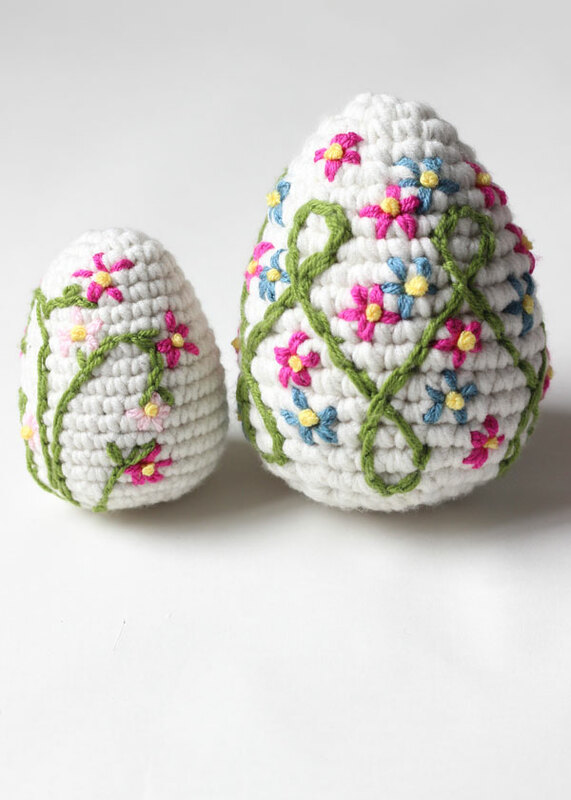 Would like to make embroidered butterflies on my eggs any ideas how? That’s a nice idea. Um, not sure! Maybe chain stitches for wings?